IISC 2019 – IISC 2019 Notification with Schedule for PG Courses Released!! 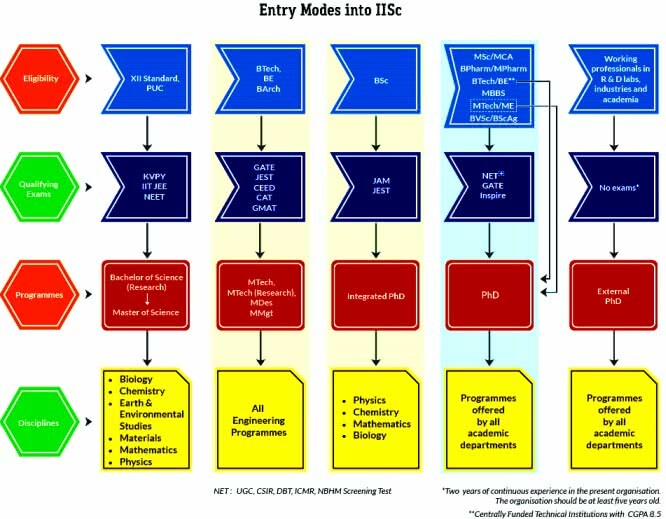 IISC 2019: Indian Institute of Science (IISC) is a public institute located in Bangalore, India. IISC admission notification for academic session 2019-20 will release on the official site of IISC institute in the month of February. No exam is conducted for entrance in various UG, PG & research courses. Only for M.Tech & M.Mgt courses, an aptitude test will be organized. 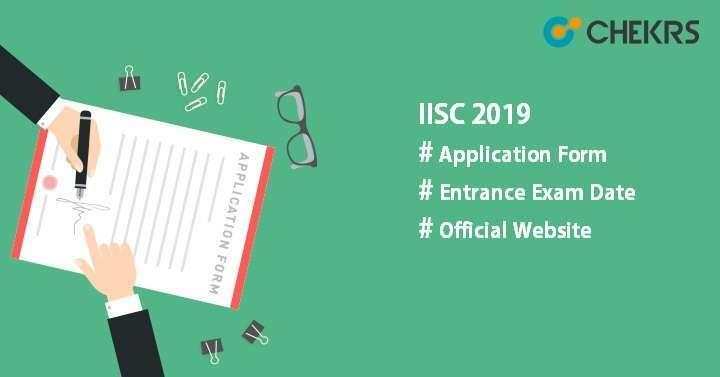 Latest Update: IISc 2019 Application Form for PG will be available from 1st February 2019. Latest Update: IISC 2019 Notification with Schedule for PG Courses Released!! The admission process is done on the basis of national level entrance exam such as JEE, NEET, CEED, JAM, JEST, UGC NET, CAT, MAT, KVPY etc. Candidates who will qualify the above-mentioned entrance test will get admission into various courses offered by IISC. Interested candidates can check important details like IISc Admission Procedure, exam date, criteria, counselling etc here. All candidates who want to take admission in IISc can check the expected dates of IISc 2019 here. Candidates can check the given eligibility criteria before applying for the IISc 2019 Selection Process. Must have passed 12th or equivalent examination. Students who will appear for the class 12th exam in 2019 can also apply. He/She must have scored minimum 60% aggregate in marks in 10+2 with Physics, Chemistry, Mathematics / Biology together. Applicants must have qualified entrance exam like KVPY, JEE, NEET and other exam. MCA candidates will be eligible for IISC 2019. Candidate should have GATE 2017/2019/2019 score card. Must have BTech / BE degree with first division/class. Candidates should have GMAT, CAT 2019, and GATE 2019/18/17 score card is mandatory to apply. Applicants must have bachelor’s degree in engineering/technology or other field. Following are the steps for applying for IISc Application Form. Visit the official site of IISC, Bangalore. Click on the link “Online Application” given on the home page. It will move to next page, click on “Apply to UG Programmes”/ “Apply to PG Programmes”. Fill the application form with all required details like personal details, educational qualification, and contact etc. Upload the photograph & signature. Pay the application fee through online mode. Submit the form after filling it completely. Take the printout of form for future use. Check Application Fee according to courses and categories. The fee is non-refundable; any bank or payment gateway service charges must be borne by the applicant. Payment options: Online payment through net-banking, debit card, visa/master credit card. KVPY: Applicants who appeared in 2017 & 2019 KVPY exam and selected for fellowship can get admission in IISc. For SC/ST students, KVPY students are selected through the empowerment initiative. JEE: Candidates must appear in JEE 2019 exam and have to score minimum 60% for general candidates, 54% for OBC-NCL candidates, and 30% for SC/ST/PH candidates. NEET: Students who will appear in NEET 2019 and obtained at least 60% (GN), 54% (OBC-NCL) and 30% (SC/ST/PH). IISc will select the candidates on the basis of following admission or selection procedure for PG courses. Tech/ M.Des: for M.Tech & M.Des, selection will be done on the basis of marks obtained in GATE 2017/2019/2019 or CEED 2019 score. A design aptitude test and interview will be conducted by the institution to shortlist the candidates. Mgt: Selection will be made on valid GATE/CAT/GMAT score. An aptitude test will be conducted by IISc to select the candidates for M.Mgt course admission followed by an interview process. IISc, Bangalore will release the cutoff on its official site after the submission of application form and updating of score of various qualifying exam. All candidates who applied for the application form and now waiting for the cutoff can check the IISc Cutoffs through online mode. Applicants, who will achieve the minimum required cutoff, will get admission into various UG, PG and PhD courses offered by the IISc. A Merit list will be prepared by the official authority of IISc for the shortlisted candidates. On the basis of merit list, selected candidates will be called for next round i.e. either interview or group discussion. IISc Admission 2019 Merit List will be different for PG & UG courses. Candidates can see merit list according to their course. IISc Counselling is the last step to get admission into various courses offered by IISc Bangalore. On the basis of candidate’s performance in the qualifying or national level entrance exam, seats will be allotted. Counselling will be held for both UG & PG courses and the venue will be university campus. The university will release an allotment letter or say call letter. Applicants can download the IISc Counselling Call Letter from the official site and report at the counselling venue along with it and score card. Students have to confirm the allotted seat by paying the college fees at the time of counselling. If anyone fails to do so, they will be not considered for the further process and there seat will be allotted to other candidates.